Patients: Av. 50-60 stoma operation patients per year. Patients mainly 60-80 years old. Also 2-3 paediatric patients. I have been using ProVIS with my patients for around 12 months, and it has opened my eyes to what medical products my patients are receiving. I am now far more aware of patients who are ordering significantly more than recommended by the PrescQIPP guidelines for Continence and Stoma patients; as ProVIS compares patient ordering to these guidelines. My ProVIS report allows me to see which of my patients may be inappropriately using their products and therefore over-ordering. ProVIS allows me to be targeted when identifying high priority patients as it ranks them according to the amount of product they are ordering and equips me with the information I need to tailor my consultations and re-educate them around specific products and usage. When I receive my ProVIS reports from Fittleworth, I identify those who may be over-ordering appliances. Then, when I see these patients in clinic, I take the opportunity to ask them discreetly about their appliance usage and try to understand why their usage may be higher than expected. In addition to re-education, ProVIS reports help me to deliver tangible and real-time cost saving to the NHS, which supports me when speaking with Medicines Managers. I am continuing to use my ProVIS reports and intend to present a report of my cost savings and re-education tactics to my CCG. This reduced the patient’s requirement to change their bags and provided better value for money for the NHS. For more information on ProVIS and to register for your free reports, visit the ProVIS page here. If you find it difficult to call patients to discuss their product usage, wait for them to come into clinic and speak with them face-to-face to address any over-ordering patterns you observe. Patients: Mainly 60-80 years old, also a number of younger patients. Typically 210 ward contacts a month, 21 nurse clinics, 22 stoma clinics, 18 consultant clinics and 22 home visits. After an assessment of areas of GP prescribing by the NHS Rotherham Medicines Management team, it was acknowledged that GPs had limited involvement with intervention to prescribed stoma products in my area. It was therefore decided to transfer the prescribing and budgetary management to those best equipped to manage the service; the nurse specialists. Being one of the nurses in charge of the stoma care budget, it is vitally important to understand my patients’ needs and how best to address these while maintaining control over budget. We initially ran a pilot scheme where we manually checked our records of 60 stoma patients to identify those who may be over-ordering or incorrectly using their products. The scheme was successful, providing improved management for a number of patients, but the process was time consuming and labour intensive. Therefore, the suggestion that we reviewed all prescription templates of over 800 stoma patients in our area, in the same way, was not realistic or feasible. Then a Fittleworth representative introduced me to ProVIS; a free and unique patient management tool that provides sight of Fittleworth patients’ prescribing spend for products and appliances across the market. Providing patient level data, presented as a comparison to PrescQIPP stoma and continence guidelines, ProVIS made it quick and easy to identify patients potentially over-ordering or inappropriately using their products. Using the ProVIS ‘top 30’ list, alongside our own clinical notes and patient database, I am now able to quickly identify patients who would benefit from a review, re-education or additional support. There have been a number of patients whose prescribing patterns have been made more efficient and cost effective as a result of ProVIS data, at no detriment to their care or choice of products. Some of these examples are outlined as case studies below. Following a few months of successful results, I approached the NHS Rotherham Medicines Management team with ProVIS, and they too are now using the tool. Their use of ProVIS is slightly different to nurses, focusing on the overall budget at a CCG-wide level and does not highlight patient specific data, but the overall aim is the same – maintaining patient care and product choice, while reducing unnecessary spend and wastage. 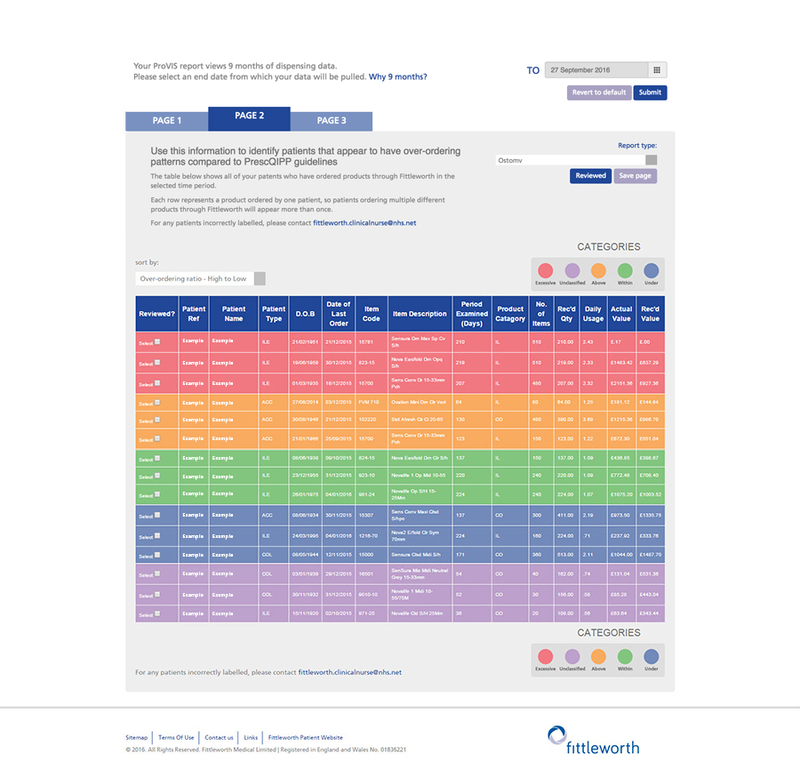 Start at the top of your ProVIS report ‘top 30’ list and work your way down, identifying areas where you could improve patient care and reduce costs. By targeting your highest potential over-ordering patients you can make the most impact, providing long term cost savings for you and your CCG. Patients: Over 1,000 ostomates, with around 25 clinic appointments per week. Working alongside the local prescribing authority, the specialist nursing team and I were keen to ensure that the service we provide our patients places them on the optimal care pathway. On analysing stoma spend, it was discovered that use of stoma care products and accessories was the third largest local NHS spend and we therefore needed to make prescribing more efficient and cost-effective. In light of this, the patient pathway was adapted to ensure all patients who had not been reviewed in the last 12 months were automatically flagged by the prescribing authority and directly referred to the clinical nurse team for review. As the initial reviews were carried out, it quickly became apparent that there were a great number of patients whose needs had changed since their last review and were using products that were not best suited to them, where alternative products would be more appropriate. Throughout the reviews, it appeared that many patients were misusing products, which led to skin problems and discomfort. Some of these patients felt that this was part of living with a stoma and so had not come in for a review. Other patients were identified to be stockpiling products and using unnecessary appliances that continued to be prescribed following a trial period. 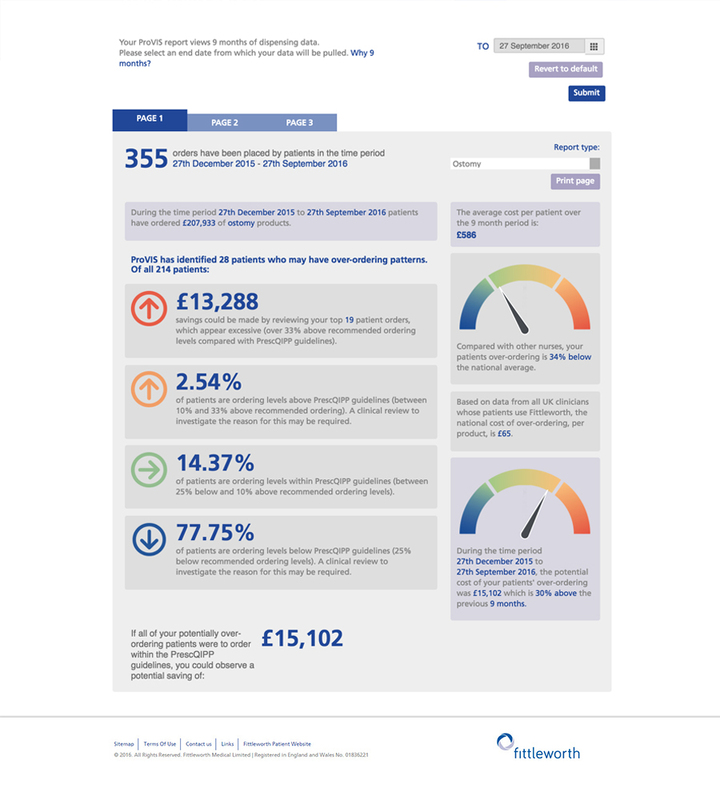 Although the annual review system was effective, patients were only flagged for review if they had not been seen for a 12 month period, which meant that patients could have been receiving and using inappropriate products and appliances for a significant period of time, potentially causing themselves harm and unnecessary NHS spend. A little while after we started the initiative, my local Fittleworth representative introduced me to ProVIS, a free patient management tool that alerts to potential patient over-spend. The tool provided my nursing team and me with unique information on patient prescribing for my Fittleworth patients. The information presented in ProVIS clearly highlighted patients who were over-ordering products by benchmarking usage against PrescQIPP guidelines. Using the ProVIS list of my ‘top 30’ potential over-ordering patients, we were able to quickly identify patients in need of a review, without waiting for them to be flagged in the annual review system. This dramatically reduced the time these patients could be potentially misusing products, causing themselves harm. 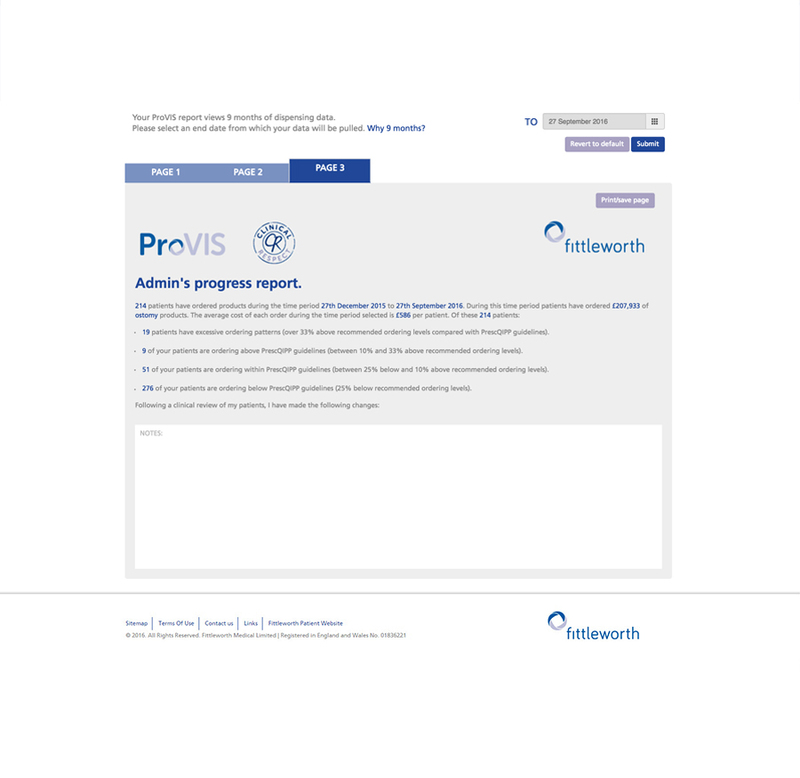 The benefits of ProVIS meant that for those patients using Fittleworth, we were able to keep a tighter control over their prescribing patterns to ensure that they were receiving the right products at the right time. Throughout this ongoing review process, all patients that were called in for a review required some form of assistance, whether through education around product use, providing more suitable products or resolving other stoma-related issues. Using ProVIS to help identify patients who may be encountering issues with their stoma has improved patient care and reduced potential product wastage and misuse, ultimately resulting in cost savings to the NHS. Think about checking your patients outside of a scheduled review time. ProVIS will give you a steer about who to speak with first and then you can take appropriate action.